Being a confirmed Wig Wamaniac myself I've been anxiously awaiting Wig Wam's first studio album since the wildly successful Wig Wamania and the most glamtastic live album ever, Live in Tokyo. Finally, Non Stop Rock 'N Roll has hit the streets, so its time to wiggle into your spandex and makeup and get crazy. But before I wax eloquently about the latest from Norway's greatest glam rock band, one thing must be mentioned right off. Wig Wam has signed with international marketers of melodic rock and metal, Frontiers Records in Italy. This is a grand thing: I hope that Wig Wam will get greater international recognition and distribution by hooking up with this prestigious label. (I hope Frontiers doesn't screw this up.) They may even make some impact in America; my fingers are crossed. Now on to Non Stop Rock 'N Roll. Honestly, I think long time fans may struggle with this album. I've had to listen to it at least three times to get my head around it, and I'm still not sure why I feel there's disconnect from earlier material. Fundamentally, Non Stop Rock 'N Roll is a more mature Wig Wam: the songs are stronger and more diverse than previous material. The hooks that charm are still there like great vocal arrangements and catchy choruses, but they're wrapped in a greater depth of composition. By example, Wild One and C'mon Everybody rock, but also display both Wig Wam's musical skill and song craftsmanship. Yet, conversely, listening to the present and the past, one could say that Wig Wam has always been more clever than one would suspect from a "glam" band. In other words, Wig Wam are damn fine musicians doing some great melodic rock from first to last. Ultimately and what attracted me from the very beginning was Wig Wam's simple melodic, almost sly pop, sensibility. They could rock with a multitude of infectious musical banter. It's all still here on Non Stop Rock 'N Roll. Songs like Do Ya Wanna Taste It, C'mon Everybody and especially the title track are enthusiastic heralds of Wig Wam's arena rock. In the end, the studio inhibits Wig Wam; these songs need to be played live. Then we'll see the glam extravagance and sing along. 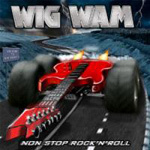 Wig Wam's Non Stop Rock 'N Roll is dynamite stuff. But what the hell, I dig these guys. Non Stop Rock 'N Roll crowns Wig Wam as the kings of Scandi melodic glam rock in the world. I'm lovin' it (but you'll never find me with spandex and eye shadow), and so should you. Recommended! Wig Wam's Non Stop Rock 'N Roll is dynamite stuff. But, what the hell, I dig these guys. Non Stop Rock 'N Roll crowns Wig Wam as the kings of Scandi melodic glam rock band in the world. I'm lovin' it, and so should you.